Carolyn E. Jinkerson, 72, of rural Fairchild, passed away suddenly on Wednesday evening April 10, 2019, while being transported to the hospital. Carolyn Elaine Jinkerson was born Dec. 19, 1946 in Eau Claire. She was raised by her grandparents in Eau Claire, and it was there she attended school. On Sept14, 1963, Carolyn was united in marriage to Richard A. Heath and to this union their 3 children were born. The family lived in rural Fairchild where Carolyn enjoyed her quarter horses. Carolyn remained in her home after her husband passed away on February 2, 2002, and she later married Richard Jinkerson in Dec. of 2003 in Eau Claire. In addition to raising her children she had also worked at the Osseo Vet Clinic for many years. She then worked a short time at Ashley Furniture before taking a position with Nortech Industries in Augusta, working there until her arthritis made it hard for her to do her job. She had more recently worked for Richard and Thea Vojtik in Fairchild. She had also served as the Fairchild Township Treasurer for many years. Carolyn affectionately named her property Little Pines Ranch. After moving to Fairchild her love of horses took over. 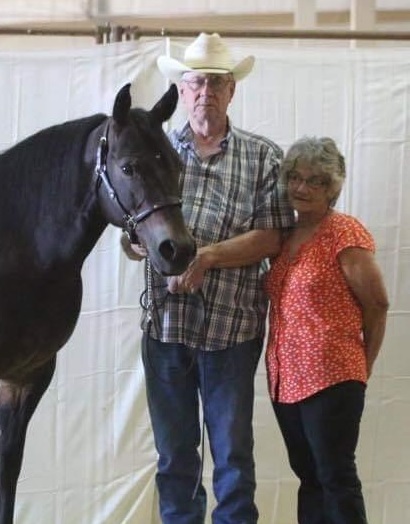 She raised quarter horses to breed, sell, and show. With her family they often showed locally as well as a few further venues. She looked forward to putting her horses, children and grandchildren into local parades so others could enjoy them. Carolyn will be dearly missed by Richard Jinkerson, her loving husband of 15 years; 2 sons, Allan Heath(Susan Richardson) of Lakeville, MN, Ricky Heath (Chris Buonauro-Hestekin) of Osseo; daughter Kathy Tobin (Aaron Gall) of Osseo; 4 grandchildren, Jamie Heath, Austin Tobin, Nicholas Knutson, Corey Heath; 5 great grandchildren, Nathan and Aidan Heath, Larissa Johnson, Mariah and Maddox Abramzcak; 4 step daughters, Krista Johnson of Augusta, Sheryl Victoria, Sarah (Jeff) Berman all of Eau Claire, Amanda (Nick) Reid of Chippewa Falls; step grandchildren, Justin, Grace and Ethan Johnson, Larry and Marcus Schnack, Nicholas, Anthony and Tyler Berman, Jonathan and Luciana Reid; and step great grandson Jax Schnack. Carolyn was preceded in death by her grandparents, Glen and Elsie Clark; sisterLois Ruskin; and step granddaughter, Victoria Schnack. A celebration of Carolyn’s life will be at a later date. The family is assisted by Anderson Funeral Home in Augusta.